Logos are important. They represent the team. And in some cases (The Cowboy's Star; the Yankees NY) they can become iconic and represent something more than just the franchise. Here, in no particular order, are some of the best and worst. Rate them and write back with some of your own. Excellent Design, incorporating the "W" and "S" into a Cougar profile. Nice. How can you not like a steroid-juiced bird flexing? Much better than the silly growling NC State logo. A lot of people hate this old one. I love it. A bad-a$$ Patriot ready to rumble. Awesome. Also, love the fact that this was red, white and blue. No stupid silver (how is silver a patriot color?) to help sell jerseys. Very 70s. Very cool. Another discontinued one. Look at this grizzled dude. Needs a shave. Angry. Totally cool. I would definitely wear him with pride if I lived in Idaho. Great name. Great logo. Nothing else to say. I mean, check it out. He's got a cape. I am a sucker for tradition and simplicity and this Red Sox logo is awesome. Big ups to Boston for going back to their old logo. Nice. Speaking of simplicity. Love the simple horseshoe on the Colts here. Only 2 colors to their uniform. no stupid grey or black added—just the 2 colors. Simple, iconic. Awesome. There's simple and elegant, and then there;s this. Kudos to the designer for making a logo that's actually kinda neat for team with the name "Flying Squirrels." I'm tired of cats names in college sports. How many Wildcats or Tigers names are there. Come on, be more imaginative. That said, the simple paw print is elegant and cool. 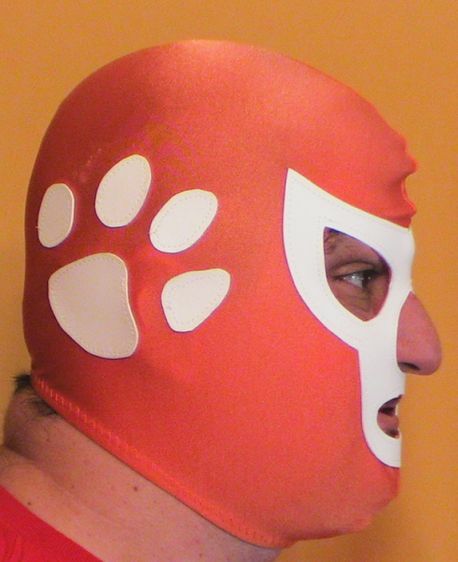 And of course, major cool, for making it a Mexican wrestling mask. A goofy bird with a sweater. Not exactly imposing. It's a towel. Their logo is a towel. Did CBS get residuals for this logo? What the hell is a flying tiger? A tiger head with giant wings? Looks like a crappy heavy metal cover band logo. Can't see why they got rid of this one? Who wouldn't want their logo to be a giant Indian running across a Midwest map with a tiny loincloth with KC on it? And that's it for now. Suggest some of your faves and worst sport logos. I was always partial to the Steelers, one side of the helmet etc. Good choices on the good and bad. Plus, I totally agree about the Oakland Raiders, I love that one. I've always liked minor league ballclub, Lake Elsinore Storm's logo. I've always hated football Cardinals helmets. Arizona and Louisville.